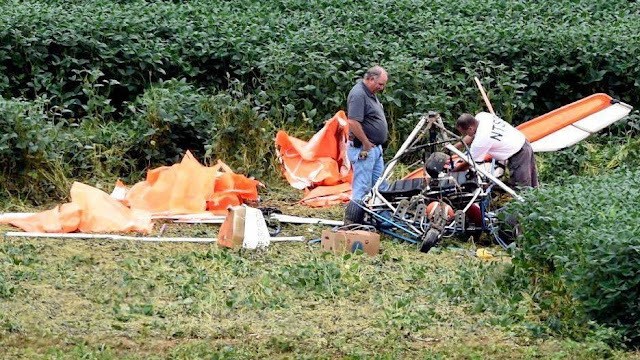 On August 18, 2018, about 1040 eastern daylight time, a Quicksilver MXLII Sport, N105SE, experienced an in-flight loss of control and descended uncontrolled into a farm field located near Baugher's Orchard Airport (07MD), Westminster, Maryland. The private pilot and one passenger were fatally injured. The privately owned and operated airplane was substantially damaged. The airplane was being operated under the provisions of title 14 Code of Federal Regulations Part 91 as a personal, local flight. Visual meteorological conditions prevailed at the time and no flight plan was filed for the flight that originated from 07MD about 15 to 20 minutes earlier. The manager of 07MD reported that the accident pilot flew into the airport solo on the morning of the accident, arriving about 0930. While at 07MD, the passenger wanted to go for a ride, and the pilot who was going to fly locally, agreed to take him. The passenger obtained goggles from the manager for the intended flight. The flight departed and flew around locally. After about 15 to 20 minutes, the pilot returned for a landing to the south (usual because of upsloping runway), but because an airplane was departing to the north (usual because of downsloping runway), the accident pilot orbited to return. While north of 07MD and flying in a southerly direction, between 100 and 200 feet above ground level, witnesses reported hearing a crack sound, followed by seeing either the left or right wings collapsed, or upward folding. The airplane then descended steeply and impacted the ground. The airplane's ballistic parachute system was only partially deployed. Sections of the fractured leading and trailing edge spars of the left wing, fractured trailing edge spar sections of the right wing, fractured bolt that attaches the lower and upper wing cables to the outboard section of the right leading edge spar, and fractured left aft tri-bar downtube fork with separated piece were retained for examination by the NTSB Materials Laboratory. The airframe parachute system was also retained for examination at the manufacturer's facility. Michael Kilpatrick spent decades of his life flying. As a teenager and in his early 20s, Kilpatrick, 62, of New Windsor, began flying hang gliders off of hills in Jefferson, Maryland, his sister Kim Thrasher said. “He was just always interested in being up in the sky,” she said of her late brother. It was while piloting that plane Saturday morning that an incident occurred, and Kilpatrick’s aircraft crashed in a field in Westminster. The incident remains under investigation by the National Transportation Safety Board. The crash killed both he and his passenger, Robert Johnson, 56, of Woodsboro. Both were pronounced dead at the scene after the plane crashed just before 11 a.m. Saturday, according to a news release from Maryland State Police. Peter Knudson, a spokesman for the NTSB, said Monday morning an investigator was on the scene 8:30 a.m. Sunday and worked all day to begin trying to piece together what occurred in Saturday’s crash. Knudson said the investigator was again on the property Monday, and likely would finish up there by Tuesday morning. The pilot and passenger were the only people on board the single-engine plane, according to the release. The crashed plane was found in an open field near the Baugher’s Orchards and Farm property. “He died doing what he loved doing,” Thrasher said. Thrasher said her brother was an “avid flyer” with his ultralights, and was the president of the area’s Ultralight Flyer’s Association. Knudson said the NTSB does not yet know what caused the plane to crash. There was some sort of “fly-in breakfast” on Saturday that those in the plane were attending, he said. Thrasher said Kilpatrick was coming in for a landing when the incident occured. The breakfast was also a sort of airshow, she said, and it was during the event that Kilpatrick was flying, she said. Thrasher said it’s unclear if the plane had a mechanical failure, or if he was trying to pull his parachute. “He was extremely experienced” as a pilot, she said, and was an instructor. Kilpatrick knew how to get out of any situation that could happen in the air, she added. “This had to be [some sort of] catastrophic failure,” she said. Knudson said the on-scene investigator will be focusing on documenting the crash site and interviewing witnesses, of which there were several. A preliminary report will be out within a week or two of the incident, he added. The full investigation though, Knudson said, will take much longer. The full report, including the probable cause and contributing factors, will take 12 to 24 months to complete. Investigators will be looking at all aspects of the incident, including the pilot, the aircraft and the operating environment, he said. “We start with all possibilities on the table and then we rule things out,” Knudson said. In addition to flying, Thrasher said her brother was dedicated to his wife of 15 years, Jeanne. While the couple did not have children, Thrasher said Kilpatrick had more than two dozen nieces and nephews, and about a dozen grand nieces and nephews. “He was always the favorite Uncle Mike,” she said. Kilpatrick had many hobbies and interests, she said, and people knew him for “all different walks of life.” He was active in his church, St. Andrew's Presbyterian Church in Mount Airy, she added. Thrasher said Kilpatrick was giving Johnson a ride in his plane when the incident occurred. Johnson, who was the Maintenance Area Supervisor for Urbana High School in Frederick County, was remembered Monday as “a great guy and a great asset” by Brad Young, the Frederick County Public Schools Board of Education president. While Young said he knew Johnson from his time in FCPS, the two met more than three decades ago in church at the Evangelical Reformed United Church of Christ. Young said their kids went through Sunday School together. “I just know he was a highly respected person in our school system,” Young said. Johnson was always in a good mood with a smile on his face, he added. “[He was] a person with a big heart,” he said. WESTMINSTER, Md. (WBFF) -- Maryland State Police have identified two men that were killed after a small plane crashed in Westminster near Baugher's Orchard and Farm Saturday morning. Troopers say the deceased are identified as 62-year-old Michael Kilpatrick, of New Windsor, and 56-year-old Robert Johnson, of Woodsboro. Kilpatrick was the pilot and Johnson was the passenger. Both were pronounced dead at the scene of the plane crash earlier Saturday. According to authorities, a 2006 Ultralight Quicksilver single engine plane crashed soon after take-off from a private air strip along Baugher Road near Hughes Shop Road shortly before 11 a.m. Kilpatrick and Johnson were the only ones on the plane. Preliminary information from investigators indicates the plane had just taken off from a private airstrip. The crash is said to have occurred not far from the airstrip. The Federal Aviation Administration and the National Transportation Safety Board will be handling the investigation. Maryland State Police troopers say that they will not speculate on the cause of the crash. The cause of the crash will be investigated and determined by federal authorities. Two people were pronounced dead Saturday after a plane crash near Baugher Road in Westminster. The incident is under investigation by the Maryland State Police, and Federal Aviation Administration officials are expected to arrive on scene. 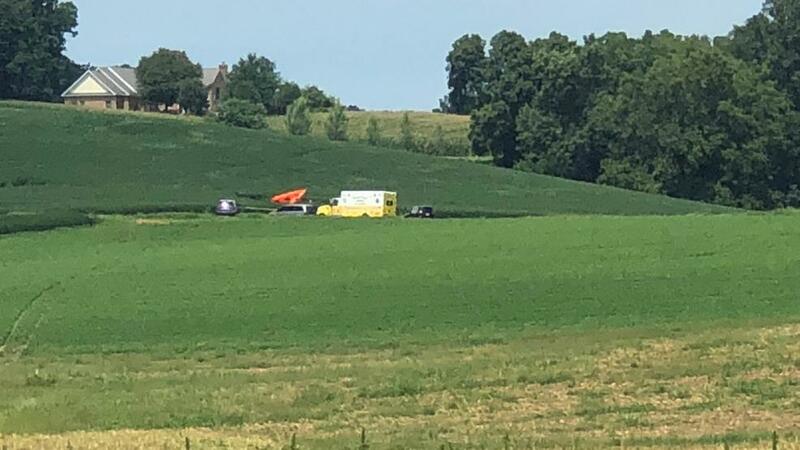 According to Maryland State Police, a small plane crashed soon after take off from a private air strip in Carroll County. “Emergency service responders pronounced the pilot and the passenger of a 2006 Ultralight Quicksilver, deceased after their plane crashed shortly before 11:00 a.m. today,” according to a state police news release. The identities of the two victims are being withheld, pending next of kin notification. The pilot and passenger were the only people on board the single-engine plane, according to the release. The crashed plane was found in an open field on the Baugher’s Orchards and Farm property. State police expect to issue an update later in the day. “The cause of the crash will be investigated and determined by federal authorities,” according to the release. The Pleasant Valley Community Fire Company was the primary responder. They were assisted by the Westminster Volunteer Fire Department with an engine, ambulance and all terrain vehicle, Pleasant Valley volunteer fire company spokesman Steve Wantz said. Michael Charles Kilpatrick, 62, passed away on August 18, 2018 while doing what he loved, flying over the fields of Frederick and Carroll Counties. He is survived by his beloved wife Jeanne Kilpatrick. Mike was born August 1, 1956, to Earl and Marilyn Kilpatrick. He was born fifth of eleven siblings. Mike knew early on that he wanted to become a pilot, and took courses while in high school, attaining his first pilot's license in 1975. Mike continued living his dream by becoming a naval airman after graduating from Magruder High School in 1975. During his 23 years of service in the Navy he received countless achievements and accolades. He was a flight engineer on the P-3 Orion for many years and that service brought Mike to ports of call all over the world. Mike retired from the Naval Reserve in 2000. Mike was also an electronics technician for Orbital Science and Fairchild Industries, and a waiter for 12 years at Phineas Restaurant. 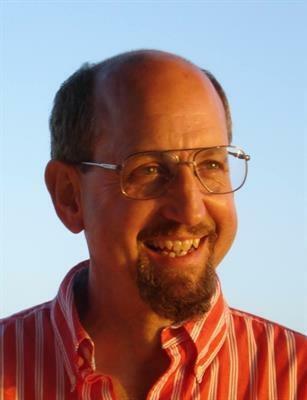 Mike was currently Project Manager for Mast Construction, Mount Airy. Mike served diligently at each of these jobs usually working two or more at a time. He loved serving and being with people. In his free time Mike was a part of many community organizations; flying clubs, Patriot Guard, and an Elder of St. Andrew's Presbyterian Church. He was very loving in his faith and was always available for a conversation about his love for Our Lord. He loved being a pilot; he said he felt closer to God while flying. Never complaining, always appreciative, his life was an example and beacon to all who knew him. His ever shining star will never shine so bright as it will now that he is in the loving arms of Jesus Christ. Mike's beautiful, loving and supportive wife Jeanne helped make him the man we knew. His faith, his comfort, and his love developed through their special bond. Their connection later in their lives was Mikes' missing piece he had searched the world for. Although he leaves her now, he leaves her surrounded by family and many dear friends. Nieces and nephews: Kevin Lauer (Lizzie), Danny Lauer, John Lauer, Chuck Lauer (Melanie), Jennifer Sincevich (Alex), Michael Kilpatrick (Tabby), Melissa Crowley (Conor), Jimmy Kilpatrick, Amalie Eig (Adam), Joseph Malochee (Brooke), Moey Malochee (Andrea), Andre Malochee (Suzanna), Terry Malochee, LaRita Malochee, Gregory Kilpatrick, Bradley Kilpatrick, Lorraina Hull, Karla Hull (Jose Amaya), Steven Hull (Yvette), Lindsey Hartsfield (Ben), Rebecca, Christopher Garten (Martin Majewski) Colleen Gershey (Josh), Brian Garten, and Kalvin Thrasher (Makayla Sexton). There are also many great nieces and great nephews who will fondly remember him always. Mike is also survived by the loving Norris family. His mother-in-law Ruth Botkin, his father and mother-in-law Ken and Elli Norris; Siblings: Clint Botkin (Joyce), John Norris (Nora), Jim Norris (Lisa), Maria Smith (John), Kelly Zimmerman (Mary). Nieces and Nephews: Kristen Salmon (Jeff), Krista Bologna (Chris), Josh Norris, Ashley Norris (Brian Richards), Erica Waters (Mike), Christi Mayberry (Scott), Vincent Bender, Luke Bender (Danielle), Riley Bender (Justine), Joren Bender (Amy), Sydney Norris, Jessica Norris, Brendan Elliott, Logan Elliott (Katarina), Devan Elliott, Ryan Zimmerman (Tara), Kyle Zimmerman (Halle), Drew Zimmerman, Noah Zimmerman. The family will receive friends from 10-11 AM on Saturday, August 25, at St. Andrews Presbyterian Church, 609 Center Street, Mount Airy, where services will begin at 11:00 AM with Rev. Daniel Melton officiating. Interment will be private. In lieu of flowers please donate in Mike's name to St. Andrews Presbyterian Church, 609 Center Street, Mount Airy, Maryland, 21771. 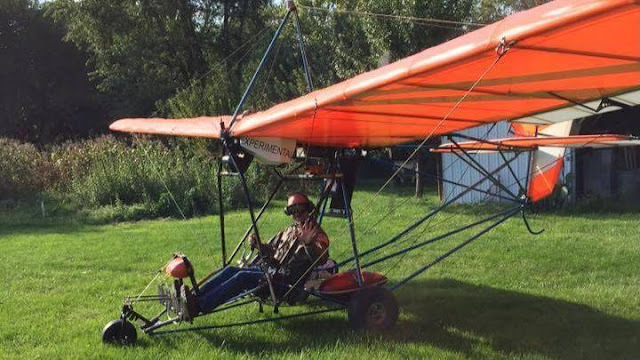 Robert Allen "Robbie" Johnson, 56, of Woodsboro, Maryland, passed away unexpectedly in an Ultralight Plane Crash on August 18, 2018. Born on September 29, 1961 in Frederick, he was the beloved son of Edward and Jeannette (Wachter) Johnson. Rob never knew a stranger and enjoyed many events with family and friends. He enjoyed helping people and giving a kind word and telling a joke. He enjoyed the occasional motorcycle ride with family and friends and attending ultralight gatherings. He worked for Shipley Bottling Company, Barnes Cabinet Shop, Rylan Home, Klipp and Sons Plumbing and retired from Frederick County Public Schools, Urbana Cluster working with the maintenance department for 18 years. He was a beloved son, father, brother and friend. In addition to his parents, he is survived by his sons, Jesse Tyson Johnson and partner Andy of Washington D.C., and Jacob Edward Johnson and wife Katie of Portland, ME. He is also survived by his sister, Susan "Susie" McConnell and husband Pat, and their children Ian, Justin and Kate of Ijamsville and his brother, Grayson "Andy" Johnson and wife Beth, and their children, Tyler, Morgan and Kyle. In addition he is survived by his life partner, Laurel Johnson of Woodsboro and numerous nieces and nephews. The family will receive friends from 5-8pm on Thursday, August 23, 2018 at Stauffer Funeral Homes, P.A., 1621 Opossumtown Pike, Frederick, MD 21702. A Celebration of His Life will be held on Friday, August 24th at 1pm at the Frederick Church of the Brethren, 201 Fairview Avenue, Frederick, MD 21701. In lieu of flowers, memorial contributions may be made to Habit for Humanity of Frederick County, 117 E. Church Street, Frederick, MD 21701.